There was sad news out of the entertainment industry in January when we learned that the incredible Alan Rickman has passed away. While Mr. Rickman was known primarily for his film work, he was also a television, theater and voice over actor. His double bass sound was something truly unique; he could sound terrifying, intriguing, mysterious, and, oddly, loving all at once. He was a legend among us, and the acting industry as a whole is less without him. Mr. Rickman’s career began on the stage, where he studied theater in London. His first venture beyond the stage took place in the late 1970s, when he accepted several small television roles. In 1985, he headed back to theater performances, earning a Tony Award nomination for his portrayal of Vicomte de Valmont in Les Liaisons Dangereuses. After that, Mr. Rickman shot to fame on the big screen for his role in Robin Hood: Prince of Thieves as the dastardly Sheriff of Nottingham, along with the part of Hans Gruber in Die Hard. That success was nothing compared to what he achieved with the Harry Potter series, though. Rickman played the part of Severus Snape with uncanny skill and precision, garnering much critical acclaim for his part in the series. On the voice over side of things, Mr. Rickman also worked tirelessly to bring his characters to life. Perhaps his best known voice over project was that of Marvin the Paranoid Android in The Hitchhiker’s Guide to the Galaxy, a role which his voice was uniquely suited for. Other VO work included work on Help! I’m a Fish, King of the Hill, and Alice in Wonderland. His final project, Alice Through the Looking Glass, was also a VO part, and was recorded shortly before his death. 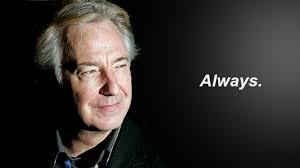 Mr. Rickman was a true genius in our industry. Whatever project he was involved with, he owned it, breathing life into his roles and transforming them into believable characters, whether they were villains, foolish husbands, or animated figures. Rest in peace, Mr. Rickman. You were - and still are - an absolute legend. Are You Getting CREDIT Where Credit's Due? Are Pay-to-Play Websites Right for You?